Senior nurse Ann Noonan tells why she and other members of the Irish Nurses and Midwives Organization have decided to strike: The government’s apparent refusal to pay nurses a competitive wage has led to severe understaffing, which in turn has caused widespread care delays, safety risks to patients, and burnout among nurses. 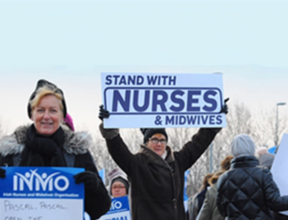 January 8, 2019 – Today The Irish Times published a strong op-ed in which nurse Ann Noonan explains why she and other members of the Irish Nurses and Midwives Organization (INMO) are striking. Noonan says INMO is staging a series of strikes to protest low pay and understaffing, which have prevented the government-funded health service from hiring and retaining enough nurses. The senior nurse describes a health service dominated by waiting lists, patients stuck in hallways, errors, burnout, and closed departments, focusing on the “day theatre” operating room service in which she practices. Noting that she is now in her 50s, Noonan sees the new nurses beside her as “dedicated, educated and planning to leave” for jobs overseas that offer “safer conditions, better nurse-to-patient ratios and substantially higher pay.” Indeed, she argues, in Ireland “the role of many nurses has become that of an apologetic ambassador for the health service, ceaselessly saying sorry to patients for the conditions they face.” Noonan notes that the starting salary of an Irish nurse is more than €7,000 lower than health professionals with comparable levels of formal education, and so there is only one application for every four open nursing positions. She says the government’s response to protests about these issues has been denial and a refusal to consider any pay rises. So, despite the traditional reluctance of nurses to strike, that is what she and colleagues have done. Noonan closes with a plea for public support. The piece might have included more detail about exactly what nurses do for patients, why understaffing costs lives, and how nursing burnout threatens the integrity of the profession. But on the whole this is powerful advocacy for nurses and their patients, with policy arguments, specific examples, and memorable turns of phrase. We thank Ann Noonan and The Irish Times. the public health service cannot recruit or retain enough nurses and midwives to work safely. our specialist surgical skills go unused as we are redeployed. is simply not possible if patients are on trolleys, crammed into busy corridors where the lights are always on, the noise never stops and there is no space for dignity, family or recovery. Privacy is impossible, with sensitive questions about medical history answered practically on top of strangers. Even the basics of human health are compromised: where is a patient on a corridor trolley supposed to brush their teeth? Noonan also details the effects on nurses themselves. She says that doing just one nurse’s work is challenging for those in their 50s, but the work of two or three nurses is too much. She says watching veteran nurses burn out has “become a regular event.” Meanwhile, new nurses are “dedicated, educated and planning to leave.” They look overseas and see better staffing ratios and pay, specifically nurses being “paid the same as those with the same degree requirement, such as physios and occupational therapists,” whereas in Ireland, the starting salary for nurses is more than €7,000 lower. Because nurses have become “valuable global assets,” she says, “the Health Service Executive now admits there is only one application for every four available nursing posts.” That is an extraordinary figure. Noonan says she does not want to continue in the role of “apologetic ambassador for the health service,” but just wants to do her job properly. when you are at your most vulnerable, nurses and midwives are there to help you. Now we are asking for your help and support. This is a passionate but reasoned work of advocacy for nurses and their patients. Noonan stresses the critical bottom-line argument that should persuade rational decision-makers: nursing pay is demonstrably too low in the relevant marketplace, and the result is an inability to fill positions that the government apparently has funding for. That in turn leads to severe understaffing, which drives nurses away in greater numbers, creating a vicious cycle. Noonan supports her points with specifics from her own experience in the operating theater and credible information about delays, mistakes, and inefficiency. She could have argued even more strongly that this kind of understaffing costs lives, since it means nurses do not have time to provide critical surveillance and treatments, as research shows. The piece would have benefited from more detail about exactly what nurses do to save lives and improve outcomes. As Noonan does say, overworked nurses are also prone to burnout, which means dangerously poor care even when nurses remain on the job. And she might have discussed the extent to which gender is an issue in the treatment of nursing that she describes. But on the whole, this is a strong op-ed that shows the public nurses matter—and what happens when they are disrespected. See Ann Noonan’s op-ed “I am a nurse – this is why I’m striking: Nurses want to force Ministers to address concerns over pay and understaffing,” published on January 8, 2019 in The Irish Times. How would I love to show solidarity with these brave Nurses by showing up on their picket line w/ an American Flag alongside other nations of nurse representatives. This is a universal issue, deserving of a universal response. Meaning the Irish nurses who have come to work in the US should form a picket line? Consequences of a single payor health system!